Clipping your own dogs or cats nails can be very beneficial to you and your pet. 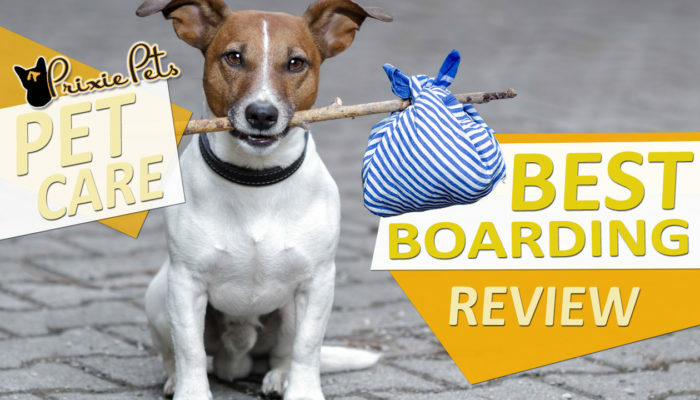 It is friendly to your wallet and can be less stressful for your pet. In order for it to be less stressful you as the owner need to be educated and able to clip them correctly. Here are a few tips that I like to give pet owners. 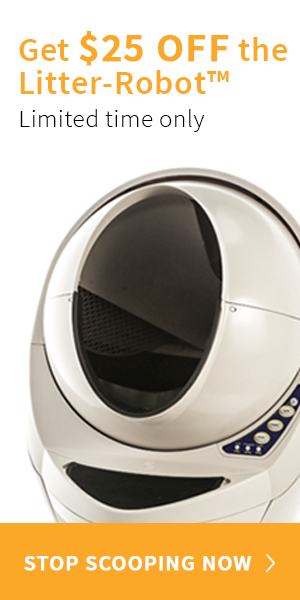 They can also be used for small pets like guinea pigs and mice, if you have the time! Start young (if possible). It’s less scary if it has always been a part of their routine. As soon as a puppy comes home start playing with their feet! Picking up kittens frequently gets them comfortable with being held (and easier to trim there nails, too!). Treats! Treats! Treats! 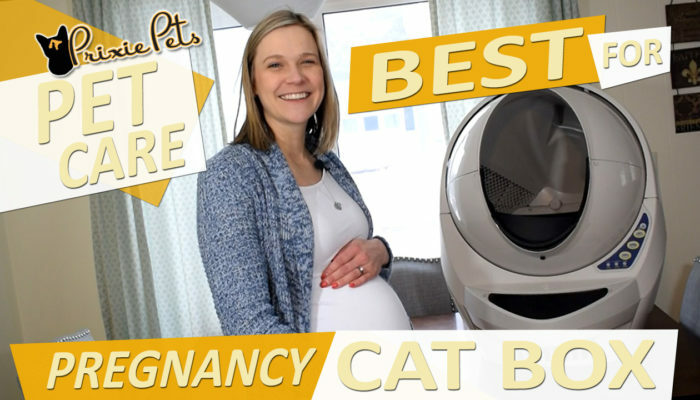 Make this a positive experience for your pet. In the beginning treat after each nail is cut. Stay calm and try not to be nervous. Dogs especially can read your energy and if you are nervous they will be nervous. If someone is around to help they can keep the pet still and comfort the animal by petting or rubbing their ears. For nervous cats having someone scruff them (holding the skin on the back of the neck) and putting a towel over their head can help calm them down. Just trim a little at a time. Cutting them to short can cut into the vein that is in their nail called the quick. This is will make for a bad experience and cause bleeding. 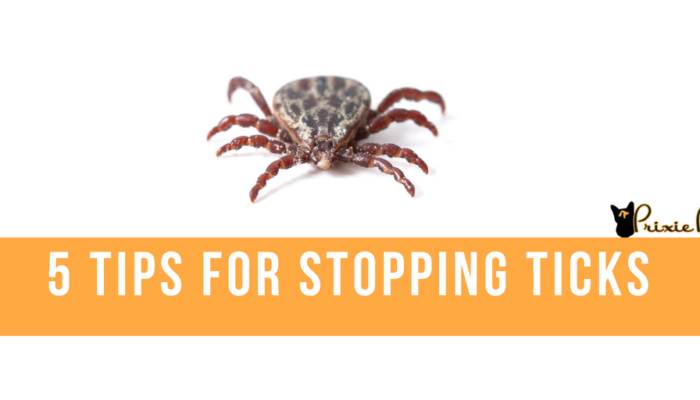 Accidents do happen, so if the nail is cut to short and begins to bleed, wipe the nail with a towel and place a small amount of styptic powder onto the nail using your fingertip. I usually lick the tip of my finger so the powder sticks to it. Be sure to put a little pressure and hold your finger there for about a minute. Using flour can work to stop the nail from bleeding too if you don’t have Styptic Powder available. Use the proper nails clippers. 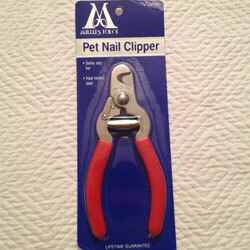 For a normal pet owner a set of nail clippers will last you years, so it is good to invest in a well-made set. I personally prefer the pliers-style nail clippers vs. the guillotine-style clippers because the guillotine nail clippers can only cut one way and they can make it hard to see where you are cutting. The brand I prefer is Millers Forge, in the pliers style, with red handles. 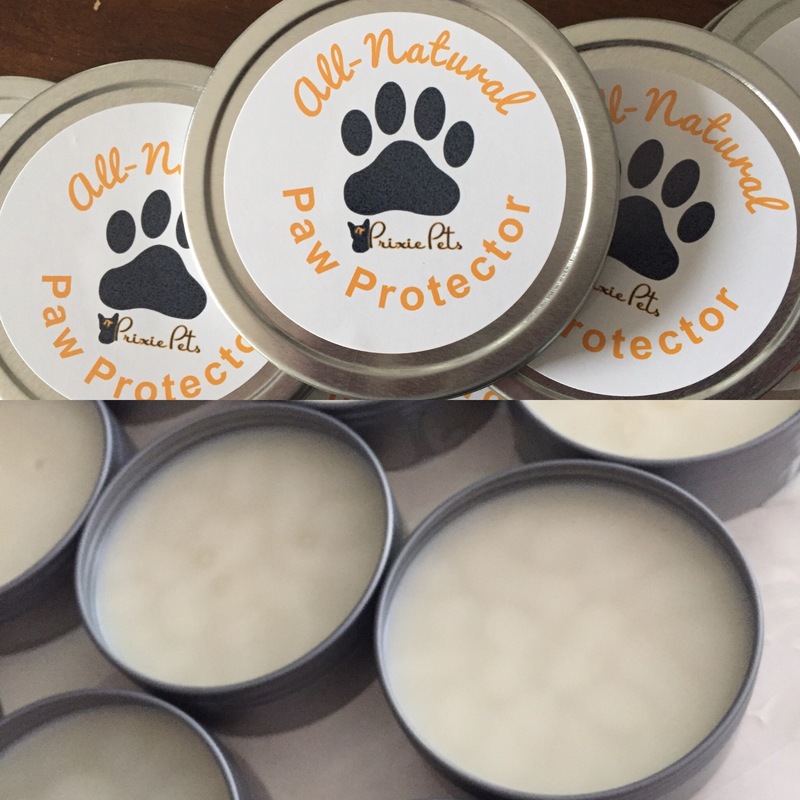 I prefer these because they work for any dog in any stage, except for very large dogs with extremely thick nails. They are very sharp, so they cut easier and more quietly. For cats nail clippers I recommend buying a more expensive pair by a reputable brand. I find the other, sometimes more expensive brands just split the nails. The brand I prefer is again Millers Forge -specifically, the Vista Cat Claw Scissors. 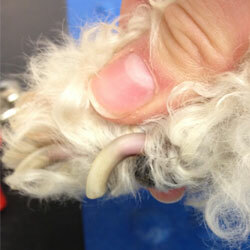 Check your pets nails frequently. 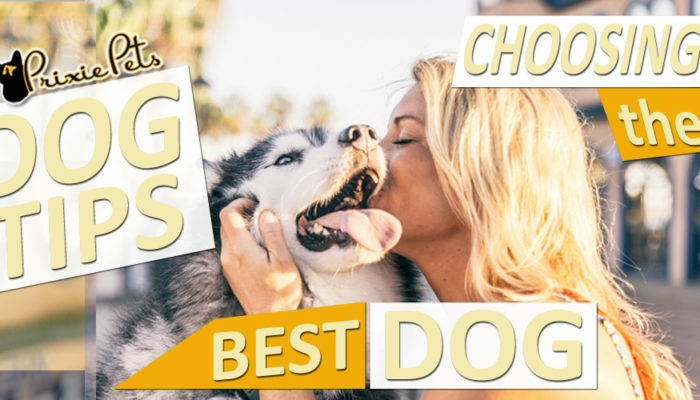 On average I would recommend checking your dogs nails every 2 weeks. 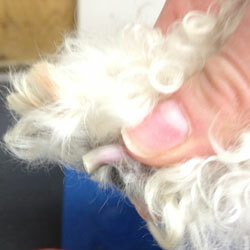 Clipping your dog’s nails frequently will prevent the quick or vein of the nail from growing out with nail. 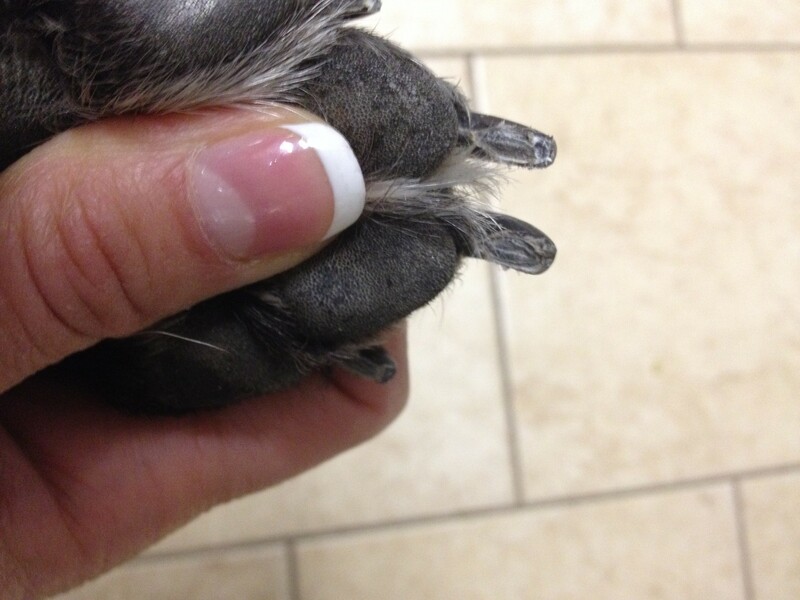 When their nails are not clipped and they grow out very long it can start to affect the bone structure in the dog’s foot. Every dog is different and their nails can grow at different paces. For example an older dog that sleeps most of the day will need its nails done more frequently than a young energetic dog. The energetic dog is more likely to wear their nails down themselves from just walking, running and jumping, especially on pavement. I recommend about once a month for cats nails. Having cat scratching posts or boxes help keep cat nails shorter and save your furniture! Educate yourself. Check out my video for a how-to demonstration on clipping nails. The more you know and understand about the nail and where the vein is the calmer and more confident you will be, putting your pet at ease. A nail before being clipped. The pink area closer to the paw is the quick. The same nail after being clipped. Notice a little bit of white left before the pink to make sure you don’t clip into the quick.